How do you get to Sharon? Practice! Oh, I mean, by Metro North train. 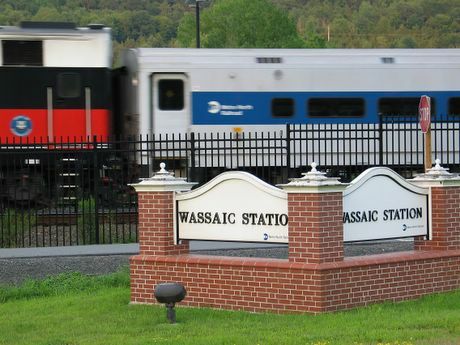 The last stop on the Harlem line is Wassaic, just south of Amenia, New York. That's about 2 hours from Grand Central Station in NYC, and less than ten minutes' drive to Sharon. I was there this afternoon picking up my family - that's their train arriving in the background. To get to Sharon I got out my front door, make a right, walk down to the next house and knock on my neighbors door. But I don't think that is what you meant! I like trains, nice shot! Trains always make a good picture - all the tales aboard I guess. Nice shot. Nice photo of that train...looks like it's moving...is it? Helen made me smile wide! Thanks. So the tribe all returned safe & sound AND without the car! Could this catch on across your great nation, and by so doing, give all of you & moreover, all the rest of us a helping hand to ensure the livinglanet survives a little while longer (Wow, NWM turns Eco-Warrior!!!). I assume Wassaic is native american... many names of natural features around here are. Nice, I like the movement of the train. I wish we had more trains for transportation around (or for freight for that matter). They ripped up a lot of track here in the 80's and 90's that they will never get back. its great that you live in such a beautiful quiet town yet so close to the most lively city in the world - NY!